Alexa Bush and Nicole Keroack’s project Acqua Venezia: Prototypes for a Sustainable Water Economy has been awarded with this years Honor Award. Winning boards are on display at the Sigal Gallery at DAC. Based on a close reading of the ingenuity of the Venetian system of underground wells the project develops a new decentralized closed loop for catching, celansing and storing stormwater to provide Venice with a source of freshwater in the brakish lagoon environment. The Project was developed in faculty design research studio spring 2011 Paradoxcity Venice at the University of Virginia. The Washington Chapter of the American Institute of Architects (founded in 1887) serves the Nation’s Capital, functioning as both the “local” and “state” component of the AIA for the District of Columbia. The Chapter was intimately involved in the design and planning of Washington, and continues to play an active role in city development today. While tourism provides a source of economic benefit for the city, it also has many costs. In particular, trash removal is a serious problem for Venice, in large part because of the scale of the city, where trash is collected by hand. Venetian authorities have mounted campaigns to get residents to drink more tap water and lessen the use of plastic water bottles, which has had success in reducing the amount of garbage generated by the city; however, these campaigns have failed to effectively target tourists. Since the 1960’s Venice has lost a significant amount of its population, due in part to the combined forces of increased tide and increased tourism as other industries have declined. The very people necessary to maintain Venice continue to depart. Thus, we argue that Venice is not sustainable as it currently exists; the pressures of increased tourism that demand a consistent image of Venice, prevent it from adapting to new challenges. We hope to imagine an alternative economic force for Venice that takes advantage of its current industries (tourism, fishing, glassmaking, lace) and setting within the lagoon to provide a more diverse set of industries, practices and rituals within Venice to enable it to thrive as a flexible managed system, upsized to better manage the increasing demands of tourism. Historically, water in Venice was a more public amenity, supplied by a distributed network of 6000 rainwater harvesting cisterns. This network has been completely abandoned, but the infrastructure still exists in the grading of every campo and sand filter beneath its stones. Currently, Venice draws water from distant sources and pipes it though aqueducts to supply the city. Drawing water from distant sources can create many conflicts of interest and creates inequities and disconnects between upstream and downstream communities. We believe there is water generating capacity in the lagoon that could be explored as an alternative source. As future bans on aquifer withdrawal go into effect (for example, agricultural use on San Erasmo) we would like to propose new more resilient strategies for water procurement. 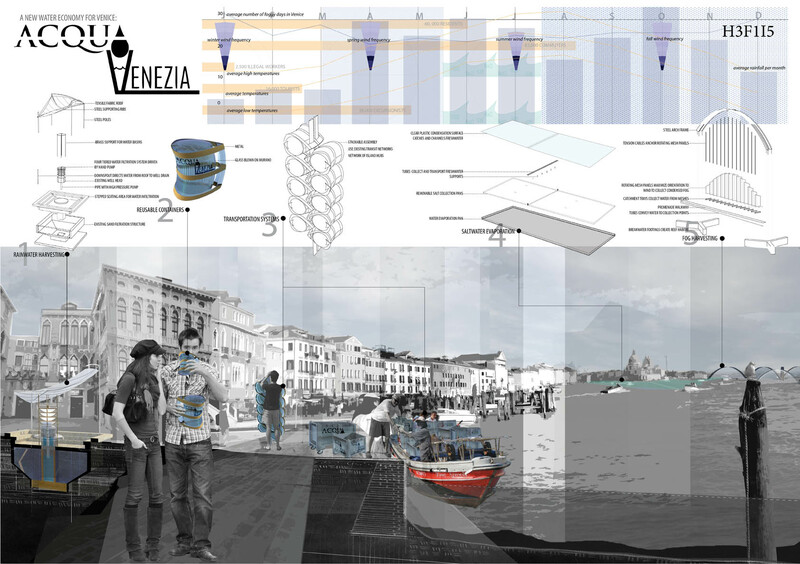 We propose to revive this system of public water as a source for tourists, as an economic catalyst for a broader water economy, a more sustainable form of tourism, a reimagination of public space and water in the city and the lagoon, and a chance to revive the processes and ecological relationships between the city of Venice and its lagoon. 1. Make potable water available at refurbished wellheads. 2. Design a water container that is both attractive for a souvenir and for reuse, and encourage both Venetians and tourists to use it, developing a “brand” of water in Venice. These bottles could be locally produced using the skilled glass workers of Murano, and generate new jobs through the deployment of this service. 3. Expand and scale the water system through local use of fog condensers and desalination centers. These systems would be concentrated in the central region of the lagoon and add a new structure to an area that is becoming an open bay through the erosion caused by dredging deep navigation channels. 4. Establish a method for water shipping, transport, and water bottle washing that meshes with the vaporetto and current lagoon scale transportation systems. • Reconnect both Venetian citizens and tourists to the productive nature of the Lagoon ecosystem. • [Re]create new centers of urban interaction around public drinking fountains.